RF Guns Mod adds one thing, the RF Gun. You can upgrade the gun using a bunch of different modules to increase its damage and add other fun stuff! 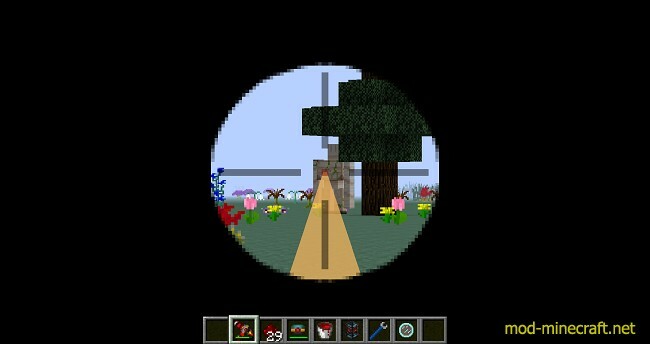 Upgrading is as simple as putting the gun and the upgrade in a crafting table together. 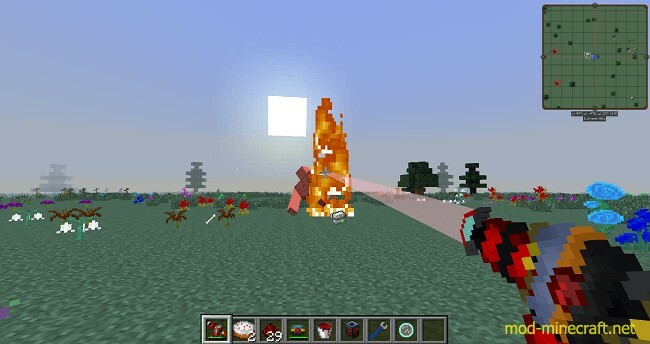 The RF Gun uses redstone flux and a fuel source, which depends on the emitter attached to the gun. Just left click to shoot! It evens cooks any dropped meat for you! The base gun uses 500 RF and 1 redstone dust per shot and does 5 damage. You can also use a different tier capacitor in this recipe to increase the energy storage. Or you can upgrade it later. Emitters affect the power of the gun the most, at least early-mid game. They also change how much power and fuel the gun uses per shot. 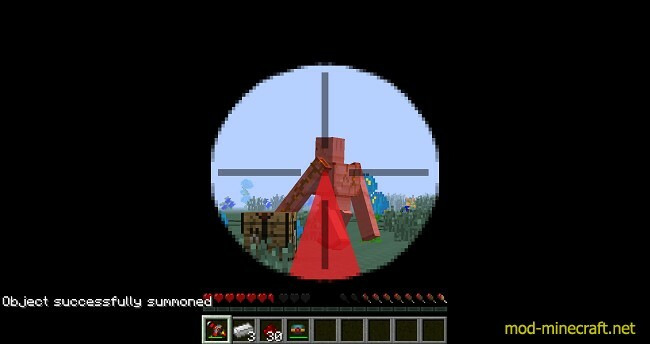 The basic emitter increases the power cost of the gun to 1000 RF but still uses 1 redstone dust per shot. It does 7 damage. 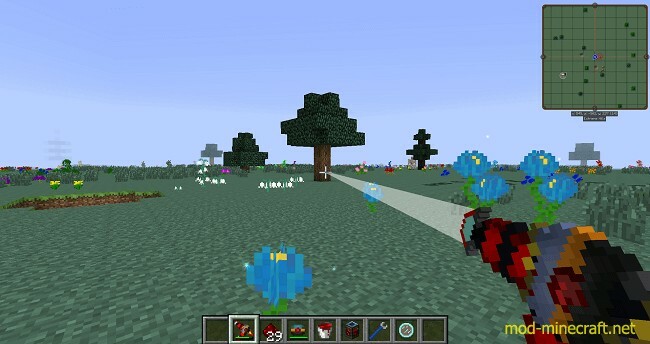 The hardened emitter uses 5000 RF and 4 redstone dust per shot. It does 10 damage. The reinforced emitter uses 50 kRF and 500 mB of destabalized redstone. It does 15 damage. The resonant emitter uses 100 kRF and 1000 mB of blazing pyrotheum. It does 20 damage. Amp chambers are much like emitters in that they have a large effect on the RF Gun’s power. Unlike emitters, amp chambers do not affect the cost to shoot the RF Gun. However, amp chambers are much more expensive that emitters. The basic amp chamber increases damage by 2. The hardened amp chamber increases damage by 4. The reinforced amp chamber increases damage by 8. The resonant amp chamber increases damage by 16. Each space-time flux unifier added to your gun increases its RF cost by 2,000 RF. The damage added to the gun is determined by number of augments ^ (2/3). In other words, the gun’s damage is theoretically infinite, but you’ll need more augments to get the same increase as the number of augments goes up. You can add multiple space-time unifiers to the RF Gun at a time, up to 8, by putting them in separate slots in the crafting table. 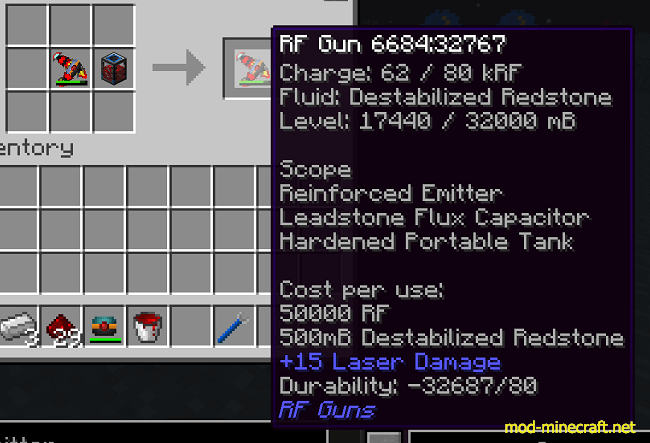 You can upgrade the RF storage of the gun by using a higher tiered thermal expansion flux capacitor. It also changes the gun’s icon! Adding a portable tank will give your RF Gun the ability to store fluids much like a tank would. The RF Gun will receive any fluids already inside the tank when it is added to the gun. You can use this to carry extra ammo for your reinforced or resonant emitters. Also, crafting with only the gun in the crafting table will allow you to extract the portable tank and any fluids from the gun. The gun can also be filled the regular way using a fluid transposer. A scope can be crafted and then added to your RF Gun. With a scope, right click to zoom in and right click again to zoom out. Left click still shoots the laser while scoped. Lenses add fun effects to your RF Gun! They also change the color of the laser beam. The blue lens doubles the range of the RF Gun, but decreases the damage by 20%. The orange lens increases damage by 20%, but halves the range of the RF Gun. The purple lens creates an explosion that scales with the power of the RF Gun. The white lens does 20% more damage to unarmored enemies. Instead of dealing damage, the yellow lens heals 50% of the laser’s usual damage to the target. The pink lens knocks back enemies hit. It also occasionally spawns cake. The rainbow lens increases the laser’s damage by 50%. The rainbow lens also makes the RF Gun deal true damage. 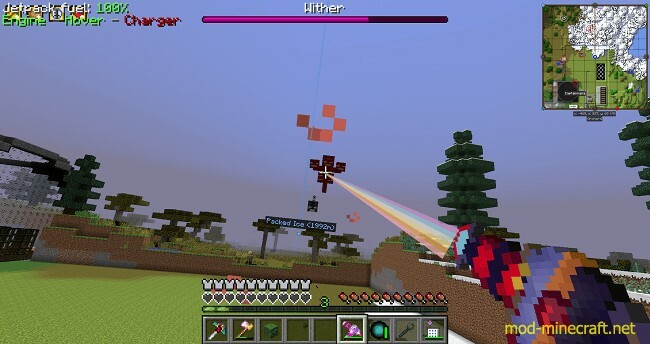 In addition to needing to craft the six other lenses, the rainbow lens requires 3 gold, 5 emeralds, and a nether star to make. Download and install Thermal Expansion Mod.